Start reading A Short History of Chinese Philosophy on your Kindle in under a minute. Responsible for reintroduing the study of Chinese philosophy in the 20th century, Feng Yu-lan is considered the father of Neo-Confucianism. He studied at Columbia University and taught at Quinghua University and Peking University. He died in 1990. 5.0 out of 5 starsFantastic captivating! This book is pure joy to read the author is not only a scholar but excellent teacher and communicator.it is comprehensive but flows smoothly it is a great tool for learning Chinese Philosophy while enjoying it ! 5.0 out of 5 starsThis book is a revelation! I got interested in Confucianism after seeing an exhibit on Korea at the Philadelphia Museum of art. I checked out a few books at the library and this was one of them. It is far and away the best (in presenting concepts, evolution of thought, and readability). But, as a bonus, I discovered that its chapters on the evolution and tenets of Taoism drew my interest and excited me to learn more. So I bought the book and expect to keep it and delve into it repeatedly in the coming years. If you're interested in philosophy you'll enjoy this book and take some erudition from it. For example, I learned that the Golden Rule was a tenet of Chinese principle long before Hillel's construction of it, and that Taoism preached universal love long before Jesus did. 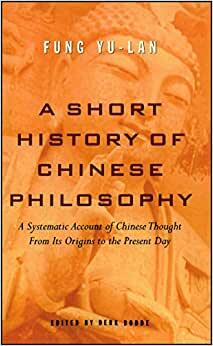 This is a great recap of Chinese philosophy; it's easy to read and full of insights. It follows the history of China through through the great dynasties. Best intro to Chinese philosophy out there. I never had any idea of where or how Chinese Philosophy emerged. This books shows a clear line of how historic events effected (sponsored) the various schools of thought and how they threaded and departed over time.